Lots of snow = lots of math! This just in from Dr. Raj! 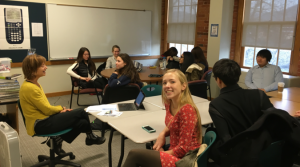 When Easthampton was shutting down, Tuesday night, with snow and Winter Advisory notices – I had this wonderful group of students at the Math Resource Center, working with each other. Senior through Freshman level students, scaffolding in action. I wound up with 11 students that night, more busy than average, significantly, no one was studying for assessments, just review and clarifications. The second trimester schedule for the Math Resource Center is now set! We’re located on the second floor of the library! Drop on by! My name is Mrs. Hill, and this year I am coordinating the Mathematics Resource Center. We now have a whole gang of wonderfully helpful, articulate, and supportive math tutors who are ready and willing to help you in the MRC! In fact, we have so many tutors this year that we will be able to offer expanded hours, so that hopefully everyone can make use of this facility. If you have a bunch of questions before a test, or if you just want to feel like you have some support while you get your math assignment done, these are the perfect people to ask. 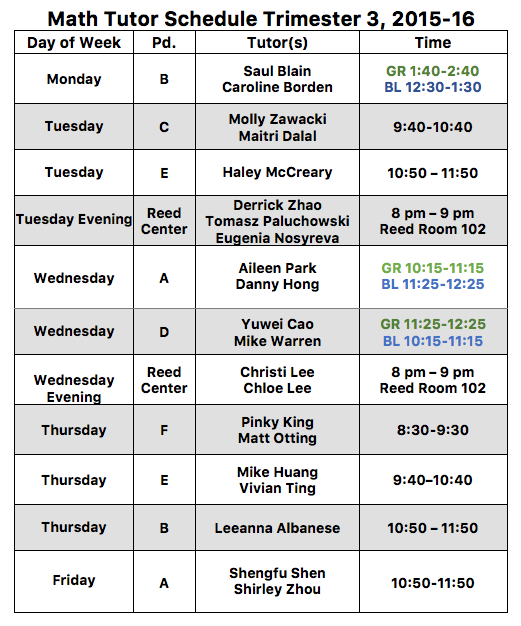 Also, this year, I will be spending time in the Math Resource Center helping out as well, In fact if you look at the schedule, you’ll see that I will be at the MRC a number of times over the two week cycle. So if you are a little nervous about asking another student for help, you can come find me instead! 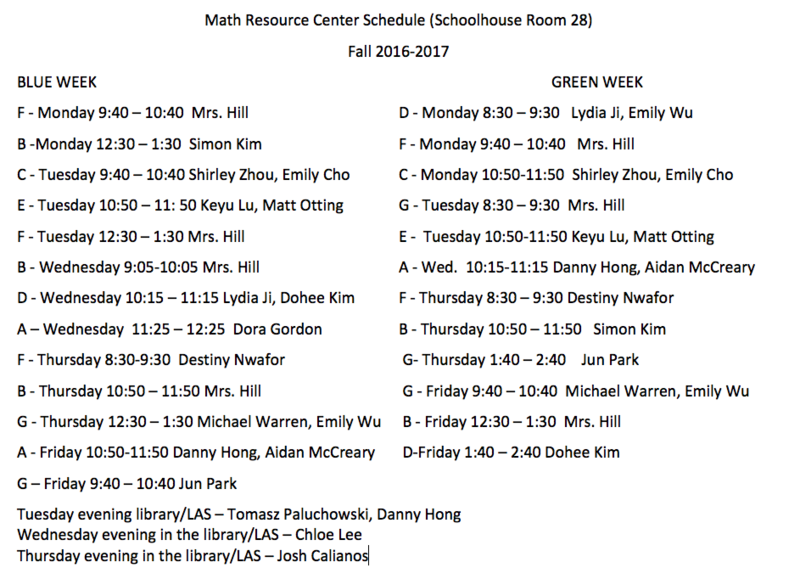 Here’s the schedule for the rest of the year for the Math Resource Center, located in Schoolhouse 28. Drop on by for some awesome extra help! 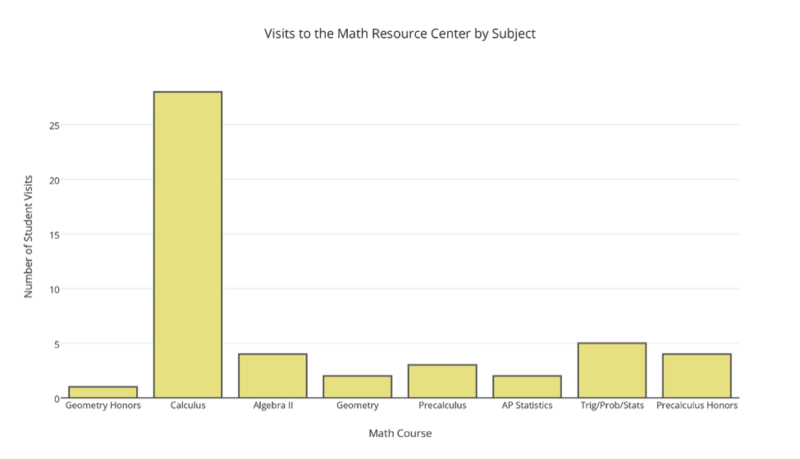 The Math Resource Center (MRC) is run by math teacher Ms. Libby Anderson. The MRC offers peer tutoring with math faculty oversight throughout the academic day and on two evenings a week. The tutors meet with students on a drop in basis for help with homework, to review a concept or prepare for a test. We are fortunate to have an entire classroom on the math floor devoted to the MRC. It is a welcoming environment with three large tables and three whiteboards. It is not uncommon to walk by the MRC and find a student and tutor or student and math teacher working engaged in problem-solving at the whiteboard. Libby has worked tirelessly to make this center operational. At the beginning of the year, she held meetings and trainings to make sure the tutors were prepared to begin working with students. She meets with and solicits feedback frequently and continuously adjusts the schedule to meet the needs of students. She sends out a weekly update early each week to the entire student body reminding them of math tutor availability. She has added tutors throughout the year using a thorough application process. There are now 19 tutors taking shifts each week. All of us in the math department care deeply about providing our students with support and appreciate Libby’s dedication to the MRC. 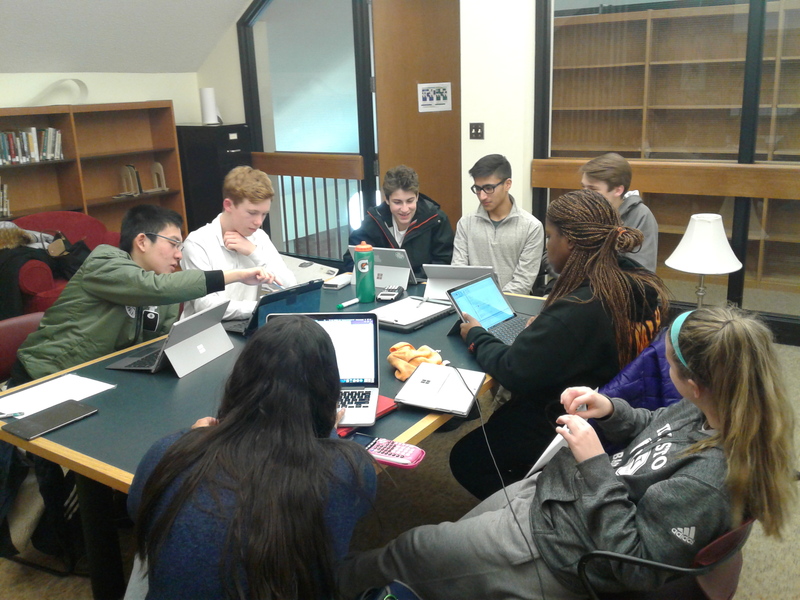 An exciting development this year has been the coordination between the MRC and Arete, a subject wide peer tutoring program run by language teacher Karen Ram. Arete helps students connect with an individual tutor with whom that student may meet on a regular basis. Libby and Karen have been in close contact in order to streamline the process for connecting students with tutors. One month of recorded visits to MRC. Math Resource Center 15-16 Launch! This just in from Ms. Anderson! This is a student-run drop-in tutoring center. No appointment is necessary. You can arrive any time during the period and stay as long as you need. The Math Resource Center is room #28 in the Schoolhouse. Tutoring takes place in the center during the class day. 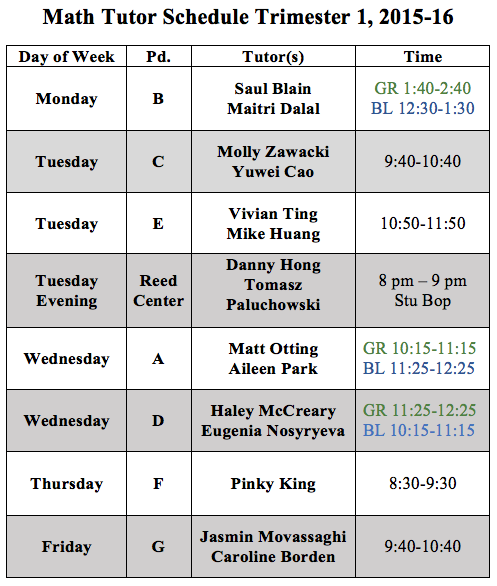 On Tuesday evenings tutoring is offered in the Stu Bop from 8pm to 9pm. Right now tutoring is available Every period (A through F), once a week, and on Tuesday evenings. If at all possible, PLEASE BRING YOUR TEXTBOOK. We are working on getting a set of student editions for the resource room but are still waiting on this. I hope that many of you discover this fantastic support system and take advantage of the service these tutors are offering. See you on the math floor! Ms. Anderson, the Math Department, and the math tutors extraordinaire!